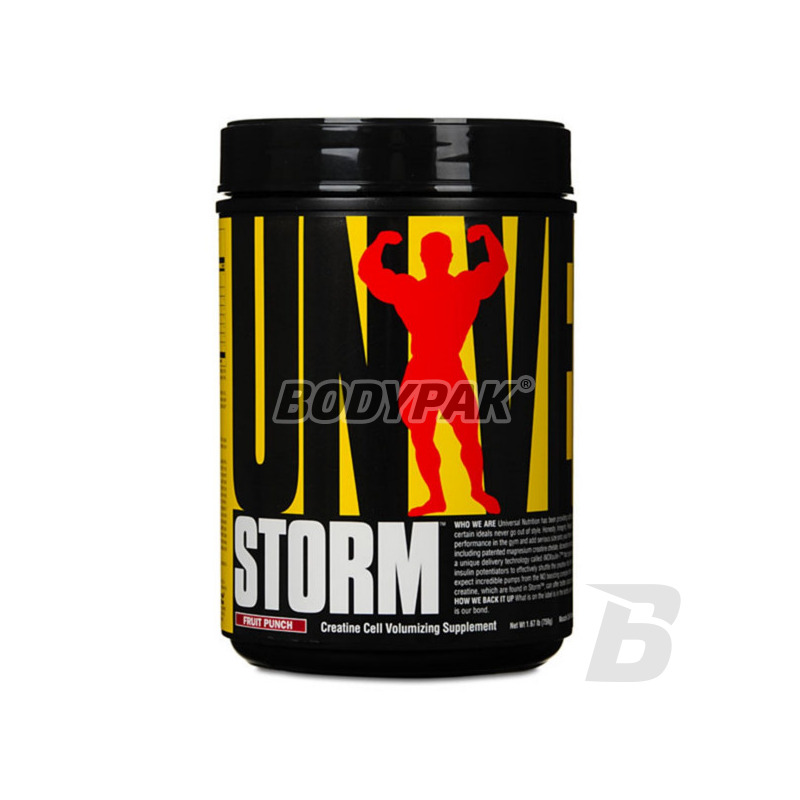 UNIVERSAL STORM is a product based on the mix until 6 forms of creatine and anabolic compounds to support their absorption and transport. This ensures that you get the maximum effects of creatine supplementation! The rich composition of this product ensures the improvement possibilities of exercise the body, already in a short time. It contains patented beta alanine, which is the best and most effective form of market. Creatine gluconate, orotate, ALFA-ketoglutarate, creatine monohydrate, MALATE TWO-CREATINE, chelator Magnesium Creatine - BLEND OF SIX KINDS OF CREATINE. Creatine is not only a strong and safe substance that also affects a number of functions in the body that determine health and good form. He participates in the transport and rebuilding of ATP - ATP serves as an energy carrier in our body, without it the course of most reactions, ranging from simple synthesis of the muscle contraction, would be impossible. Creatine for its ability to bind phosphate groups (then transformed into phosphocreatine) participates in these, transport and rebuilding of ATP. This amazing compound higher rate of protein synthesis - by increasing the amount of water retained in the muscle cells contributes to a more anabolic (growth promoting) environment. Creatine inhibits catabolism - thanks to their ability buffering helps to maintain proper muscle pH. It is very important that the majority of the enzymes responsible for the breakdown of muscle tissue, can only operate in a very acidic environment. Creatine located in UNIVERSAL STORM exhibits antioxidant properties - helps fight dangerous to health, free radicals. Their activities in extreme cases can even lead to the formation of cancer - it is worth before them secure. It also prevents a number of harmful effects arising due to oxidation podczaswysiłkowego. It helps protect the heart either directly, as in the heart of which is a high concentration of creatine, and indirectly by regulating the level of cholesterol and protection from the effects of excessive stress. L-Taurine - helps regulate blood sugar levels, exerts anti-catabolic (reduces protein breakdown), increases the concentration of nitrogen in the body and helps lower cholesterol. Very important is the fact that taurine stimulates the pancreas to secrete insulin. It does, however, other than glucose, thus reducing the risk of insulin resistance that leads to diabetes. This allows us to enjoy all the benefits of insulin - a strong anabolic - without worrying about our health. Alpha-ketoglutarate of L-Arginine - involved in the formation of nitric oxide and thus has the ability to expand the blood vessels, allowing for better blood circulation in the muscles and soft tissues. Indirectly involved in the synthesis of cGMP which, together with ATP is involved in muscle contraction and has an anabolic effect. It affects the secretion of growth hormone, supports the process of liver regeneration is an important precursor for creatine. Beta-Alanine (CarnoSyn) - together with histidine is part of Carnosine, thus helps in the removal of harmful products formed during metabolic processes associated with physical exertion. It also creates a dipeptide responsible for "de-acidification of" fast-twitch muscle fibers and the correct work ATPase (an enzyme involved in the process of energy release). ALA - alpha-lipoic acid. Increases the sensitivity of cells to insulin, regulates blood sugar levels, affects the uptake of glucose and oxygen supply, stimulates the production of nitric oxide (dilates blood vessels and thus increases blood circulation), it prevents diseases of sight (high concentration of ALA can be found just in the eye) It exhibits strong antioxidant activity, a positive effect on concentration and stress resistance. 4-hydroxyisoleucine - it acts by stimulating the pancreas to produce insulin optimal (depending on the amount of glucose in the bloodstream), or protected from the excessive secretion (in the case of diets with excess sugars). In addition, 4-hydroxyisoleucine increases the tissue sensitivity to insulin, resulting in increased transport of nutrients to the muscles. 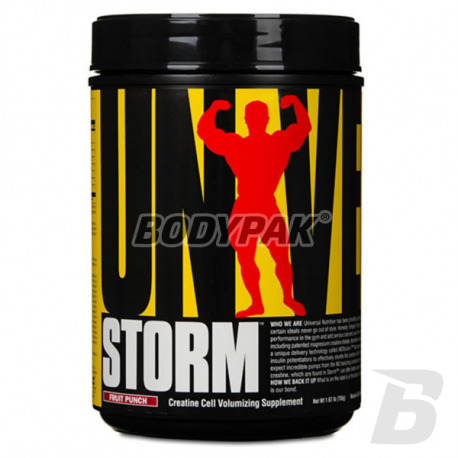 UNIVERSAL STORM - an ideal product for a successful cycle of creatine! 1 serving, mix with water. Apply 30 minutes before workout. Jeden z lepszych stacków - legend na rynku, siła idzie w górę, w połączeniu z shock therapy robi dobrą robotę! Stack legenda.Co prawda są w tych czasach lepsze stacki kreatynowe, ale nie ma sie do czego tutaj doczepic.Jak za ilość 821g to cena jest przystępna.Smak winogronowy calkiem niezły.Polecam. Moim zdaniem jest to kolejny bardzo dobry produkt od Universal Nutrition, opiewający w legendy! Suplement legenda. Stosowanie go to +10 do motywacji. Szczerze? Nie ma roznicy miedzy monhydratem tej firmy a stormem w dzialaniu. Kolejny produkt Universal godny polecenia. Do tej pory stosowałem monohydrat ale przestawienie się na ten stack kreatynowy było strzałem w dziesiątkę. Przyrost siły można odczuć już po tygodniu, a w ciągu miesiąca udało mi się skoczyć z wagą 6kg do przodu. Jestem zaskoczony działaniem tego produktu. Minusem może być jedynie smak. Mam wrażenie, że jest za słodki. Świetny produkt w dobrej cenie. Starcza idealnie na dobrze zaplanowany cykl. Przyrosty masy mięśniowej są ponad wszelkie oczekiwania. Łączony z Shock Th pozwala na 110% jakości treningu. Smak jeżynowy może być trochę za słodki, jednak w większej ilości wody wszystko spełnia oczekiwania. Najmocniejszy stack kreatynowy z jakim miałem styczność. Siła idzie do góry jak oszalała! Bardzo dobry stak kreatynowy. Dużo więcej siły, szybkie przyrosty na wadze. Razem z dobrą dietą, gainerem oraz zestawem Shock Teraphy i Storm przytyłem około 10kg! (jednak dość mało ważyłem, z 60kg na 70kg). Polecam! Dobra rozpuszczalność , znaczna poprawa siły już w pierwszym tygodniu , ładnie pompuje Storm , jak większość suplementów Universal godny polecenia.